WikiBranding: Thinking inside the box. Ideas at the intersection of business and almost everything imaginable. More service brands are tackling this challenge by literally thinking inside the box. I'm seeing a trend toward productizing intangible services – i.e., making the service look and feel like a packaged good you might find on a store shelf. 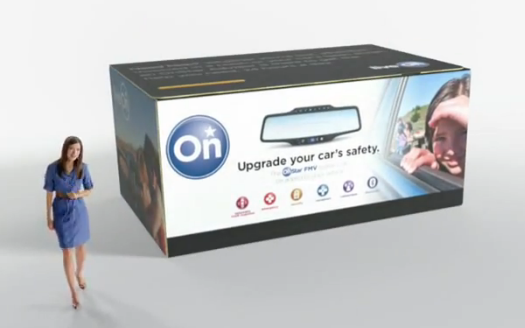 GM OnStar is the latest marketer to embrace this idea. By placing a satellite-based service in a box, it now feels like something consumers can better comprehend, something you could imagine buying at Best Buy. Perhaps GM is lifting a page from Progressive Insurance's playbook. We all know Flo works in an "insurance store" filled with boxes of insurance products. Again, seeing things in boxes = tangible = comprehensible. Going even further in this direction, Progressive's new Snapshot is truly a tangible product – a monitoring device customers plug into their car to receive safe driving discounts. Over the last few years, ING Direct has launched banking cafes in eight cities around the U.S. to help transform IRAs and CDs into a tangible brand experience. These examples provide a perfect illustration of embracing design as a business strategy, not as an aesthetic process. I'm a strategic marketing leader with a track record of success, from co-founding a successful start-up to leadership roles at global agencies; B2B and B2C marketing; brand and retail. My experience spans a range of customer and market dynamics, including retail, technology, automotive, healthcare, travel and CPG, having collaborated with marketers such as Ford, Toyota, Dell, Applied Materials, The Coca-Cola Company, P&G, Sony, Best Buy, Mattel, United Airlines, Hilton, Aetna Healthcare, UnitedHealth Group and Medtronic. I’m human centered, data driven and relentlessly curious. My priority each day is to inspire teams to be fearless in pursuit of new ideas that drive growth. I pay it forward as a lecturer at the University of California Irvine, Merage School of Business. What makes a premium brand premium? What's Danish for smart branding? Apple rediscovers the power of empathy. Shazam – The QR code of TV. A case for SMS over QR codes. The age of screen strategies. Shifting attitudes toward premium brands.